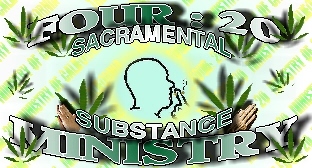 Welcome to The Four:20 Ministries web site! The newly formed religious/spiritual substance organization. Currently F.20 ministry site is still under construction, so please excuse the mess. If your still interested in joining our F.20 ministry of multiple denominations, and organize the Four20 community to end religious/spiritual persecution from the government. Its our right to utilize a schedule I hallucinogenic substance for a religious/spiritual sacramental substance. Please get in touch to offer comments and join our mailing list for specials and new announcements from F.20's very own independently ordained, Pastor, Troy W.